Learn how to make a cool scrapbook layout using a few crafty goodies and your favourite concert tickets in this week's Flashback from September 2017! Our lives are defined by what we do, whether we go to see films, visit museums, attend exciting concerts or travel the world. If you have kept your tickets safe and haven’t left them in a discarded pair of jeans from 10 years ago (well done you!) we have the perfect tutorial for you! 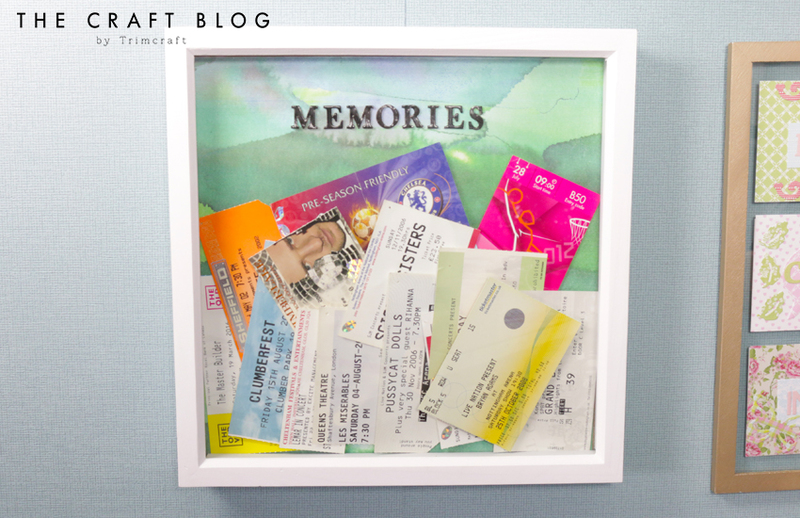 Today, Maxine is going to show you how to collate all these special memories in one with her scrapbook layout tutorial! Read on to find out how to turn these pieces of paper into a lifetime keepsake. 1. Cut your chosen First Edition Wild Flower 12 x 12 paper design to fit the back of your frame, adhere to the frame back. 2. Layer your chosen concert tickets together along the bottom of the page. Once you’re happy with how it looks, adhere with Dovecraft Perma Fix. TIP Use blu tack to test out different layouts. 3. Finish by creating the word, ‘Memories’ along the top of the scrapbook page with the Simply Creative Alphabet Foil Stickers. Line up the letters against a ruler to ensure the word is straight. Place inside your frame and hang up this fab frame in your home! What a lovely way of creating a keepsake for you to treasure the times you were listening (or dancing excitedly) to your favourite songs! This would also make a fantastic gift for a ticket hoarder in your life. You could use the same layout to showcase tickets of galleries you have visited, trips you’ve taken, festivals you’ve attended and so much more! How will you use Maxine’s scrapbook layout idea? We’d LOVE to see, so don’t forget to #trimcraft when uploading to social media and to share your projects in the Inspiration area.